Unrealistic Battles was an event mode first debut alongside the "March to Victory!" event during the 1st April 2015. It featured the new Special Purpose Sherman SPS-255 inflatable tank with rubberized armour and fired Potato and Carrot rounds. 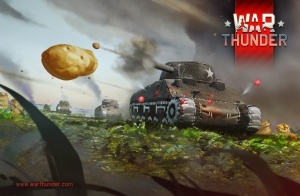 Apart from the new tank, it also featured the first and only use of a "health bar" and "hit points" system within War Thunder, making it a massive change from standard gameplay. Teams would face each other in head to head combat with a single cap point and fight it out until one team lost all tanks or all tickets were successfully drained. Another difference from the rest of the War Thunder vehicles is that SPS-255 has a health bar - or so-called "hitpoints", which may help users from other projects to adapt. This page was last edited on 28 January 2019, at 17:26.